On the final day of competition at the ASP 4-Star Mahalo Surf Eco Festival presented by Skol, Alex Ribeiro (BRA) maintained his high-performance surfing to defeat Paul Cesar Distinguin (FRA) by a score of 11.25 to 8.90, respectively. With his win today, Ribeiro earned US$15,000 in prize money and 1,000 points, which places him at 37th on the ASP Qualification Series rankings. Prior to the start of the Mahalo Surf Eco Festival, Ribeiro was leading the rankings for the ASP South America title. After his victory in Itacare, he has seized control for the continental championship. 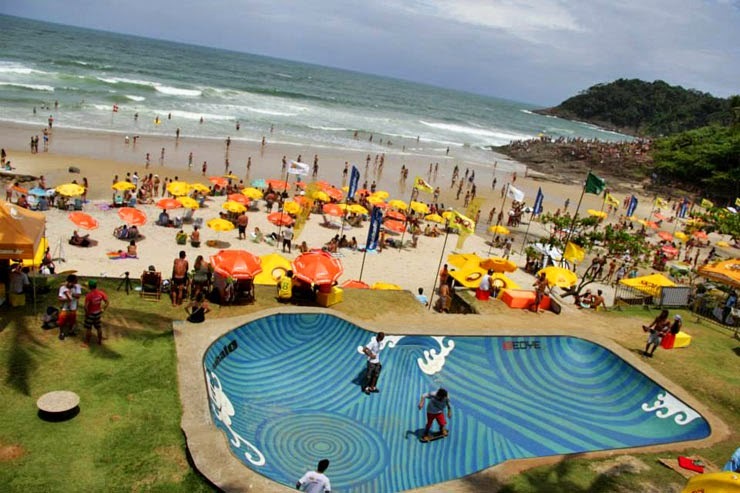 The final event of the ASP South America Series will occur at the O’Neill SP Prime at Maresias Beach from November 3-9. Jesse Mendes (BRA) and Michael Rodrigues (BRA) are the only other athletes that are in contention for the Title. Alex Ribeiro, taking down the field. Distinguin earned a 9.25 for a deep barrel ride in the Quarterfinals for the highest single-wave score of the Festival on Friday. He also displayed an impressive aerial attack throughout the event but was unable to repeat his performance during the Final against Alex Ribeiro. In the Women’s division, Tatiana Weston-Webb (HAW) defeated Alessa Quizon (HAW) by a score of 14.70 to 13.60 in an all-Hawaiian heat at Praia da Tiririca. Both surfers will be part of the 2015 World Championship Tour and have further solidified their classification with their results at the ASP 4-Star Mahalo Surf Eco Festival presented by Skol. Jacqueline Silva (BRA) lost in the Semifinals to Weston-Webb but with her result today, she has practically guaranteed her title as the 2014 ASP South America champion. Despite having one event left on the calendar (Maui and Sons Pichilemu Pro from November 13-16 in Chile), neither Silva nor the remaining athletes in contention (Silvana Lima and Suelen Naraisa) will be participating in the event. Competition resumed at Praia da Tiririca for another action-packed day at the 2014 ASP 4-Star Mahalo Surf Eco Festival presented by Skol. Wave selection proved to be crucial as athletes faced waves in the 2-to-3-foot range (1-meter), with the occasional larger set and moderate onshore winds. Krystian Kymerson (BRA) provided a number of highlights, scoring a 16.55 heat total in his Round 3 victory. In 2012, Kymerson won the Surf Eco Festival held in Salvador, Bahia. With a bid into Round 5, he is focused on repeating that feat. Krystian Kymerson is looking to repeat his 2012 victory. Young local surfer Yage Araujo (BRA) brought the crowd to its feet after pulling off several airs to earn an 8.25. Araujo was called for an interference in the heat that would cut his first eight-point ride in half but his early heroics carried him through into Round 5. Yage Araujo’s Round 4 air earned him the advance into Round 5. In a stacked heat, Jay Thompson (AUS), Yago Dora (BRA), Michael Rodrigues (BRA) and Kiron Jabour (HAW) fought to the last second to see who would qualify for Round 5. Thompson to an early lead, leaving Dora, Rodrigues and Jabour in a battle for second place. Rodrigues, who had been on a tear in recent events, looked out of sync and was not able to complete his final maneuvers. Despite showing off lightning-quick surfing, Jabour could not find a scoring opportunity and left Dora with a chance in the dying seconds of the heat. Dora wafted consecutive tailslides in tight sections to guarantee his qualification into Round 5 alongside Thompson. Cahill Bell-Warren is into Round 5. Jesse Mendes (BRA), the only remaining top seed at the Mahalo Surf Eco Festival, also qualified into Round 5 in his heat alongside Cahill Bell-Warren (AUS). Bell-Warren topped the four-man heat, which pit him against three Brazilians. In addition to the crucial ASP Qualifying Series (QS) ranking points being distributed, the ASP 4-Star Mahalo Surf Eco Festival together with the O’Neill SP Prime in Maresias will decide a 2014 ASP South America champion. Alex Ribeiro (BRA) currently leads the South American rankings after his event victory in Mar del Plata, Argentina. His victory over Willian Cardoso (BRA) in Round 4 puts him a step closer to earning the continental title. Alex Ribeiro currently leads the South American QS rankings. The tropical setting at Praia da Tiririca, located in city of Itacare, Brazil, will host the ASP 4-Star Mahalo Surf Eco Festival pres. by Skol from October 27 to November 1, 2014. Home to one of the longest-standing sites for professional surf competitions in Brazil, Itacare will gather some of the best surfers on the Qualification Series (QS) who are hungry for an opportunity to move up in the rankings. In addition to men’s competition, the 2014 Mahalo Surf Eco Festival will witness competition from the ASP Women’s QS for the first time. Altogether, the Mahalo Surf Eco Festival will distribute over U$125,000 in prize money and crucial world ranking points. The Mahalo Surf Eco Festival a traditional proving ground for future World Championship Tour stars. In 2008, the inaugural Surf Eco Festival was held at Praia do Forte, in northern Bahia, and saw Adriano de Souza (BRA) and Silvana Lima (BRA) claim the event titles. In 2009, the contest moved to Salvador, the capital of Bahia, and witnessed Alejo Muniz (BRA) defeat Gabriel Medina (BRA) for the ASP South America Pro Junior title. Following in their footsteps, Miguel Pupo (BRA) was crowned event champion in 2010, succeeded by Filipe Toledo (BRA) in 2011. All aforementioned surfers went on to join the elite ranks. There has always been an innate relationship between surfing and music at this event. The Mahalo Surf Eco Festival has been in tune with that connection since 2008 and has entertained the energetic crowds in Bahia with live music as a compliment to the show in the water. This year, the bands O Rappa, Ponto de Equilibrio, Strike and Massa Sonora will perform. Itacare, located south of Salvador, is a small, idyllic town surrounded by natural beauty. Gorgeous beaches, breathtaking waterfalls, preserved flora and fauna, unique geology and one of the best waves in Brazil are all part of the surroundings found in Itacare, Bahia. Because of this natural exuberance, the Festival has unfailingly supplied each event with a number of ecological activities, lectures, exhibitions and films. The 2014 event will be the first-ever surf contest in the world to be run on solar energy. Dendê Productions, together with the University of Sao Paulo, under the supervision of the leading authority in solar energy in Brazil, Dr. Aurélio, will be erecting a large solar platform on the event premises for the implementation of this pioneering achievement. The 2014 men’s and women’s QS events in Itacare hold an event window of October 27 to November 2. The final day of the ASP 4-Star Mahalo Surf Eco Festival presented by Skol was held under sunny skies and in front of a packed audience on the sand and surrounding point break at Praia da Tiririca in Itacaré. Halley Batista (BRA), 27, pulled off an impressive aerial performance to defeat Alan Jhones (BRA), 24, in an exciting final battle. For his victory, Batista took home U$15,000 and 1,000 ASP World Ranking points. For his runner-up finish in Itacare, Alan Jhones earned U$7,500 and 750 ASP World Ranking points. With several dramatic victories throughout the week, Jhones was pleased with his result. Krystian Kymerson (BRA) had been the standout performer all week long by consistently landing big airs, but was eventually defeated by Batista in the Semifinals. Due to his fluid style, former South American champion Jean da Silva (BRA) was unstoppable leading up to the final day of competition before falling to Jhones. With their equal 3rd place results, both Kymerson and da Silva earned U$4,500 and 563 points. Competition continued for the fourth consecutive day at the ASP 4-Star Mahalo Surf Eco Festival presented by Skol at Praia da Tiririca in Itacaré, Brazil. Fair conditions with moderate winds and waves in the 2-3 foot range (1 meter) were maintained throughout the day. The initial 128 athletes that started the competition have dwindled down to the remaining 8 Quarterfinalists that will battle for essential ASP World Ranking points and a portion of the U$95,000 in prize money. Krystian Kymerson (BRA) continued his outstanding week-long performance by boosting a full rotation aerial to earn the day’s highest single-wave score of an 8.33 (out of a possible 10 points) from the judges. Kymerson, who is defending his title at the Mahalo Surf Eco Festival, is focused on repeating his victory once again. Halley Batista (BRA) and Victor Bernardo (BRA) also advanced into the Quarterfinals by defeating Kanoa Igarashi (USA) and local favorite Bino Lopes (BRA) in Heat 3 of the Round of 16. Showing a fluid style and committed turns, Jean da Silva (BRA) has been obtaining 8-plus scores all week long and had guaranteed his spot in the last day of competition. Local surfer Alandreson Martins (BRA) had the crowd on their feet beach as he took down ex-WCT surfer Heitor Alves (BRA) in his first heat of the day and continued his torrid pace as he advanced into the final day of competition alongside Artur Silva (BRA) by defeating Ian Gouveia (BRA) and Dylan Lightfoot (ZAF) in Heat 2 of the Round of 16. A call is set for 10 am (local time) on Saturday for the final day of competition. Jean da Silva will be faced up against Artur Silva in Heat 1 of the Quarterfinals. via Quarterfinalists Decided at the ASP 4-Star Mahalo Surf Eco Festival in Brazil : ASP World Tour – The Association of Surfing Professionals. The tropical setting to the coastal town of Itacare, in the state of Bahia, Brazil, will host the ASP 4-Star Mahalo Surf Eco Festival presented by Skol from October 15-19 at Tiririca Beach, where U$95,000 in prize money and 1,000 ASP World Ranking points will be on offer to the event winner and in addition, will also crown the 2013 ASP South America Surf Series champion. The Surf Eco Festival has hosted ASP Men’s, Women’s and Junior competitions in Bahia and was first held at Praia do Forte in 2008, where Adriano de Souza (BRA) and Silvana Lima (BRA) came out victorious. Other winners included in the event’s history are Alejo Muniz (BRA) in 2009, Miguel Pupo (BRA) in 2010, and Filipe Toledo (BRA) in 2011.
via ASP 4-Star Mahalo Surf Eco Festival Confirmed in Bahia, Brazil : ASP World Tour – The Association of Surfing Professionals.